I keep hearing about Ground Beef, but I'm from Australia and I've never actually seen it before. Is it the same thing as Minced Beef? Or different? Is Minced beef an acceptible substitute if they're not the same thing? 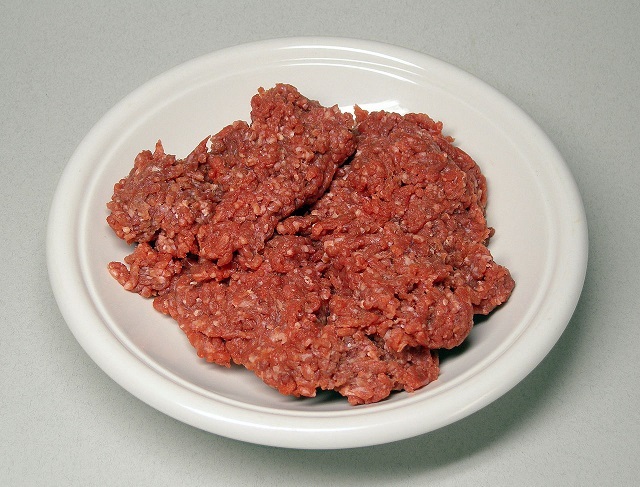 Here's a picture of some raw ground beef from the Wikipedia ground beef article so that you can see for yourself. Basically it is beef that has been run through a meat grinder, great for making taco meat, hamburgers, and the like. Yes, it is the same as minced beef. And we can also throw in the term "hamburger meat" which is ground beef with extra fat trimmings, as well as "meatloaf mix" which is typically a blend of either beef and pork, or beef, pork and veal, and "mincemeat" which is a combination of meat, fruit and alcohol. When i've seen ground meat on american cooking programmes,the meat is a lot finer than how UK mince meat ends up after browning in a pan. Mince meat is slightly chunkier. You can also get most specialty meat cutters to grind any cut of meat for you. Most ground beef you buy in the supermarket will be made from lower quality cuts. If you grind a higher quality cut you'll have the most amazing hamburgers ever. I never have time to cook a whole chuck roast so I end up having most of those larger cuts put into the ground beef when I purchase part of a cow. When you use the old fashioned mincing machine the Americans call it a grinder ,we call it a mincer ,so it must have been exactly the same in the olden days. Different qualities of mince in England contain different amounts of fat .the best quality hardly any fat! (a) Chopped beef, ground beef. “Chopped Beef” or “Ground Beef” shall consist of chopped fresh and/or frozen beef with or without seasoning and without the addition of beef fat as such, shall not contain more than 30 percent fat, and shall not contain added water, phosphates, binders, or extenders. When beef cheek meat (trimmed beef cheeks) is used in the preparation of chopped or ground beef, the amount of such cheek meat shall be limited to 25 percent; and if in excess of natural proportions, its presence shall be declared on the label, in the ingredient statement required by §317.2 of this subchapter, if any, and otherwise contiguous to the name of the product. I was pleased that the spec forbid "added water, phosphates, binders, or extenders" and toying around too much with the fat content. Compare that to the gruesome Fabricated Steak further down on the page. Not the answer you're looking for? Browse other questions tagged substitutions beef language or ask your own question. How can I make shredded beef? What cut of ground beef is ideal to mix with ground lamb for kofta? Is the advantage of wagyu and other fine beef obliterated when formed into minced burger patty?